Who came first the Man-Thing or Swamp Thing?! 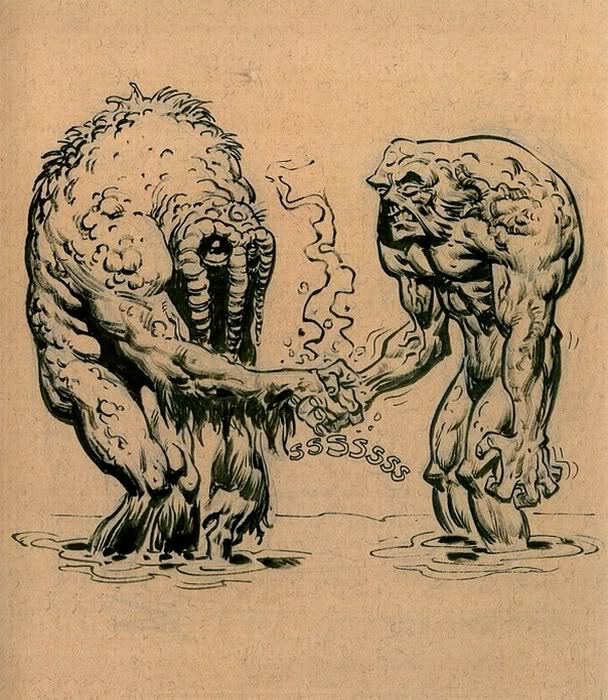 It would seem that one MUST have copied the other, they both are squishy, slimey monsters that roam around in the swamp and they both decided to have their last name be “Thing”….coincidence? I highly doubt it! Well I decided to finally check out exactly who jumped onto the scene first. It appears that Marvel’s Man thing hopped onto the scene a mere 2 months before DC’s Swamp Thing way back in 1971!! Man-Thing made his first appearance in the May issue of Savage Tales #1 and Swamp Thing jumped onto the scene in the July issue of House of Secrets #92. So even though it seems that Swamp Thing has reaped a lot more success than our buddy Man-Thing we all know who the O.G. swamp monster really was! Thank god I can finally get some rest at night now! !